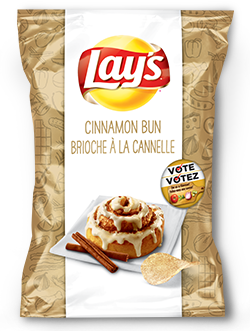 Review: Cinnamon Bun Lay’s Potato Chips (Canada) | Oyatsu Break! For the last couple of years, Lay’s Potato Chips have been taking suggestions for new chip flavours from the general public in the U.S. and Canada. Each country gets 4 new chip flavours, with one being declared the ‘winner’ and theoretically being made into a regular chip. Previous chips included (U.S.A. 2013) Sriracha, Chicken & Waffles, and Cheesy Garlic Bread, (Canada 2013) Creamy Garlic Caesar, Perogy Platter, Maple Moose, and Grilled Cheese & Ketchup. Currently, the U.S. is running their second contest, featuring Cheddar Bacon Mac & Cheese, Cappuccino, Mango Salsa, and Wasabi Ginger. And here in Canada? Bacon Poutine, Cinnamon Bun, Jalapeno Mac & Cheese, and Tzatziki (winners in bold). Why make this exhaustive list…? Heh. Honestly because we just never get stuff this cool in North America! One of the things I love about Japanese snacks is the diversity of flavours and tastes, particularly compared to North America. I’ve just been loving the hell out of these contests and getting a shot at tasting new flavours. Like a little bit of Japan back here in Toronto. So on that note, let’s start with the ‘weirdest’ flavour, cinnamon bun! Packaging: Straight to the point, big clear image, easy to read. It implores you to vote too, which is great. Moreover, the designs on these special bags of chips are actually really clearly different than the regular bags on store shelves, with the white stripe down the centre making them stand out. All in all, a good move! Scent and Taste: My husband did a quick sniff test and his head recoiled comically. These are STRONG cinnamon chips, and sugary. Amazing. The taste isn’t nearly as strong unfortunately! I know it seems weird to have a ‘sweet’ chip, but these are loosely patterned after churros, a salty-sweet, deep fried cinnamon-dusted treat. I’ve had some great, fresh churros that have a mouth-puckering cinnamon dusting, and these aren’t those… but they’re still pretty good! The Lay’s potato chip taste comes through clearly, with sweet cinnamon on the tongue. The strongest impression though, is a buttery mouthfeel. These chips are really surprisingly buttery, a sort of chip taste I’d only experienced in Japan. It compliments the cinnamon and sugar nicely. I guess that’s supposed to be the ‘bun’ part of things, but yeah, butter. It’s lovely! Verdict: I was surprisingly happy with these! I don’t think they pair with literally anything but on their own, I totally dig’em. I wouldn’t be unhappy if these won the contest…!